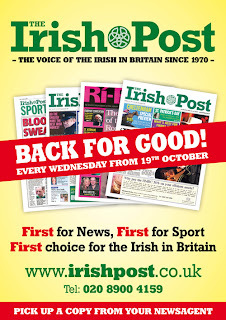 Just when it seemed that the Irish Post, the long time newspaper for the Irish community living in England, Wales and Scotland was down and out, news has arrived that it has been given a new lease of life. The owner of Loot magazine has stepped in and saved it. Recognition must be given to the efforts of the campaigning journalist Paul Donovan, who writes for the Post, as well as a number of MPs and others who raised an Early Day Motion on the issue and also established a campaign group. My fellow Green and candidate for the London Assembly, Noel Lynch, also played a role in the campaign. The return of The Post will be welcomed by the Irish community in Britaiin, which still remains one of the largest ethnic minority groups in Britain, and particularly in London.